tectra GmbH is a market leader and your partner in the area of vacuum technology, thin films deposition and surface science. It is especially focusing on the global research market at universities, government research labs, R&D institutes, and departments. It combines trade and development to support the community with high-end components and equipment. 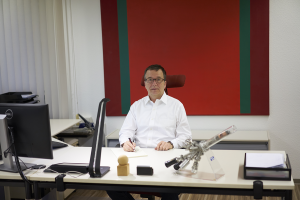 tectra GmbH is a family owned business. It was founded by Dipl.-Ing. Andreas Gati in Frankfurt, Germany in 1985. The business started originally in the field of technology transfer. tectra GmbH specialized over the years in the area of high vacuum (HV) / ultra-high vacuum (UHV) components and systems, targeting especially thin film deposition and surface science..
tectra GmbH’s mission is care, service, cost and quality, focusing on customer needs. tectra GmbH has a very experienced team with many years of expertise in the fields of vacuum, thin film deposition, material and surface science. The front team, having a strong background in physics and natural science, is listening very carefully to understand your needs and prepared to offer standard or tailored solutions for your experimental challenges. The team behind is bringing also years of experience in electronics, logistics … to ensure the customers high expectations on cost, quality and service. Please don’t hesitate to ask the team at tectra to assist you in solving your challenges. The team is committed and looking forward to your inquiry. 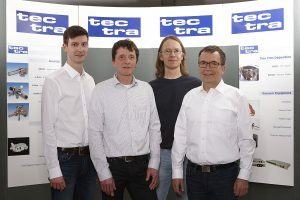 tectra GmbH is combining trade with design and production of their own products to offer standard and engineered solutions especially for the physics and material science research community. It is offering a wide portfolio of standard and custom made products, from feedthroughs, manipulators, products in the field of HV, UHV, Thin Film Deposition and Surface Analytics. 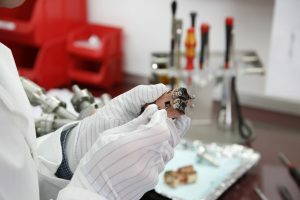 Besides the sales of vacuum – especially UHV – related instruments and components tectra is manufacturing instruments such as mini e-beam evaporator, plasma sources (atom source, ion source, atom/ion hybrid source), sputter gun, atomic hydrogen source, heater stages, and small evaporation systems. tectra GmbH has more than 550 systems and devices installed globally. tectra GmbH is working very closely with their partners around the world from countries like US, Japan, UK, Sweden, Israel, … to support the science community. The company is located in Frankfurt/Germany.